Galway corner forward Conor Whelan can expect attention from players such as Kilkenny's Pádraig Walsh in Sunday's Leinster Hurling Championship game final at Croke Park. 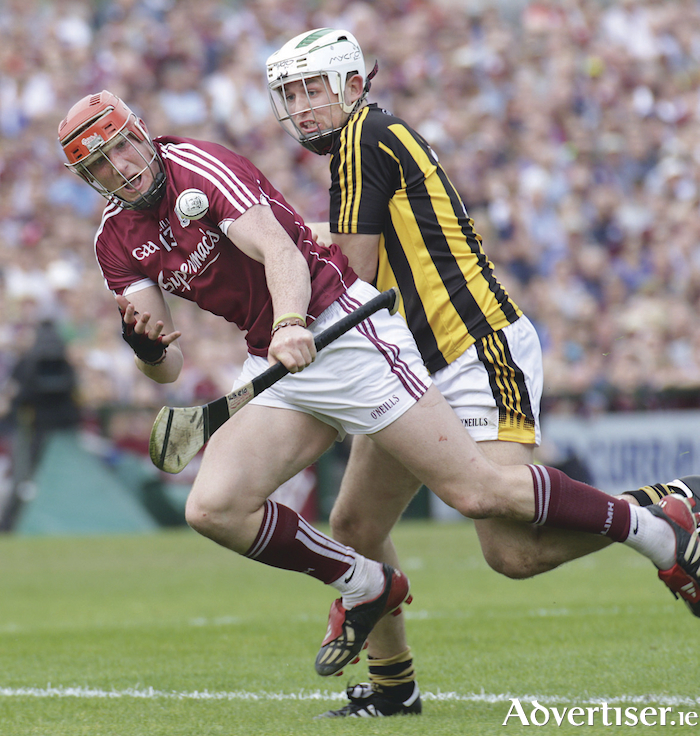 This Sunday in Croke Park current All-Ireland and Leinster champions Galway will put their provincial title on the line when they face Brian Cody's Kilkenny in the 2018 Leinster hurling final (4pm ). Galway have already faced the Cats in the Leinster round robin series at Pearse Stadium in a game Micheál Donoghue's side won handily enough, by eight points on a scoreline of 1-22 to 2-11. However Donoghue refuses to acknowledge that game will have any impact on this weekend's proceedings. "Next Sunday is going to be a totally different game to the one that was in Pearse Stadium and we're fully aware of that," he says. "The way we prepare is to take our games one at a time. We are always very respectful and mindful of the opposition, and playing Kilkenny again is obviously going to be a massive challenge this weekend. Obviously it's about ourselves now and preparing for it and getting ready for it because it's going to be a huge test, a huge challenge again." Kilkenny, he says, have been the standard-bearers for so many years and they will be targeting a big performance this weekend. "I know it sounds cold, but we just concentrate on ourselves. That has stood us well to date and that's all we've been doing." Since that defeat to Galway, Kilkenny have enjoyed an impressive win over Wexford (0-22 to 1-18 ) from which they will have gained more confidence, and the Galway manager believes his team will need to produce a big performance to regain the Leinster title. "Kilkenny have huge form behind them, and obviously in the Wexford game they produced a massive performance. Nine points down, and in typical Kilkenny fashion, they showed huge team spirit and the desire to go on. They will take confidence from that display. We know it's going to be a hard game, but it is one we are really looking forward to and our squad looks forward to challenges such as this weekend." While Donoghue's team is the only side in Leinster to win all four group games, he believes the format needs to be tweaked for 2019. "We were fortunate this year. We had the Offaly game and then had a week off again. Once we kept going, we knew the next three weeks were going to be massive for us. It was totally unchartered waters. "We've always spoken about it and every management team has commented on it that until you go through it you don't know what to expect. It's literally play, then huge emphasis on recovery and whatever knocks you have trying to get them back quick enough, and then just going straight into it again. "It was testing for us all. Thankfully we had a big squad and it was good for everyone to go through it, but there will have to be some tweaks next year. It is play, recovery and get to the next game, doing your analysis - so it was just fairly repetitive." Despite the last game in the round robin against Dublin being a dead rubber, a big crowd turned up at Salthill and the Galway players responded with a 0-26 to 2-19 victory. A few players produced some terrific displays and leadership was shown when needed most in the last 10 minutes. It was a performance that pleased the Galway manager. "The way the game played out, we had to hurl big time in the last 15 minutes to stay in and dig it out. It was massive learning and we took a lot of positives out of it, and it was a good test for us as it was our last game. Everyone puts huge emphasis on their home games, so we wanted to go out of it with a good performance and a good win, but we had to work hard for it and those wins are often the most pleasing ones." Galway are 2/5 favourites to regain the Leinster title with Kilkenny at 5/2 and the draw priced up at 10/1. On the handicap betting, Galway are minus four at evens with Cody's charges at plus four at 10/11. Galway won the 2017 Leinster final by 0-29 to 1-17 over Wexford, and if their marquee forwards such as Joe Canning, Conor Cooney, Conor Whelan, Joseph Cooney and a few other impact forwards off the bench get enough supply, then those players could hit a match winning tally. However, Cody will have his team well revved up for the contest. Playing second fiddle to Galway last year, watching them collect the three major trophies on offer, and being beaten by them in the round robin series earlier this season, will not sit easy with Kilkenny hurling folk. It should be helter-skelter for the first 50 or 60 minutes, but Galway's ball winning talent off the bench, their defensive spine, David Burke's leadership from midfield, and their winning nous should see them in the Croke Park winners' enclosure in the Hogan Stand around 5.30pm.